In life he has terrorised a vast community, after death he is remembered for his unscrupulous, inhuman methods of killing and torture, but how did a criminal like him remain out of the noose of the law for so long! Understanding and documenting physical reality and the series of events that go to change its course through time is something that modern man has every right to take pride in. But too much of attention to some phenomena inks our ability to judge the importance of an event or two with a funny hue. It questions the judgement to set priorities. Ershad Shikder who became a phenomenon, courtesy of his homicidal exploits is a case in point. It is one thing to report on a psychopath convicted of killing 24 of his fellow men, and it is an altogether different matter to feed on the voracious appetite of a newspaper reading public. The recent surge of knowledge about Shikder that spilled all over national news dailies had more to do with catering to the readers thirst for real-life horror tales than reporting. Some newspapers even went over the details of his last days spent in jail. The man who has terrorised a vast community in the southern district of Khulna, whose crimes make a mockery of our quest for a rational world, set most of the vernacular dailies to go for regal treatment -- a lead that spread across the full length of the front page. The occasion was his death sentence, which was carried out a minute past midnight on Monday, May 10, which was Tuesday according to normal count. The homicidal killer walked the gallows much to the relief of many. His execution put an end to a long legacy of killing and torture. In a country where there is no guarantee for petitioners to get justice, and perpetrators stalk the citizen holding important public posts, sympathy for a man wasted at the gallows is hard to come by. It is not even given a thought. But curiosity of the public seems superfluous. Shikder certainly is a case that exemplifies the rise of a common man to the top, with crime as his only currency. But he is not the only criminal who reigns over this land. There are many still on the loose, enjoying their fruits, sharing them with the people at the helm. Shikder at best can be termed as the classic case of a psychopath who managed to endear himself to high-ups. His mentors, the power brokers at the mantle of politics, have found in him a crony who would go to unthinkable lengths to get his own way. The list of his beneficiaries was long and no one ever made an effort to take the lid out on stories of people who also gained considerably from Shikder's crimes. Though, one or two names have been mentioned as quoted by Shikder's sister during her recent encounters with journalists, the scenario still remains incomplete. belonged to the Jatya Party in the eighties, then joined the newly elected BNP in 1991, and again jumped to AL when it came to power in 1996. This track record is no unique feat; there is a contingent of perpetrators who has this similar knack. It keeps them out of the gallows. Erhad Shikder did remain clear off of any brush with the law until he surrendered in 1999. Later one of his recent crimes -- the murder of the Jubo League leader -- put a final bent to his cases that landed him squarely inside the noose of justice. Many newspaper reports clearly point at the nexus between him and the police. From the day he was poised to take Khulna jetty under his control, the law enforcing agency was simply bought off to clear his way. And with the authority looking the other way, he went wayward. His ascend became unstoppable. "He killed, kidnapped, and did whatever it took to exterminate his enemies who stood between him and the jetty," wrote a Daily Star report. It also says that he made 550 crore taka in the last twenty years. His palatial house, in Sonadanga, Khulna, took Tk four crore to build. As a criminal who expanded his exploits in Khulna underworld, his rise crushed many lives and fed the appetite of the opportunists hungry for money and power. He got involved in the whole spectrum of crimes, including trafficking in drugs, gold, border pillars, gems, arms, counterfeit banknotes, women, children. He continued all this alongside blatant acts of robbery and extortions, which he often banked on to fatten his coffer. He did it all. But this very man has also inched his way into political power. His empire of crime enabled him to encroach on the corridor of power. It is during the regime of Hussein Muhammad Ershad that he roped in the echelons of the military ruler's Jatyo Party and he was elected commissioner of ward No. 21 of Khulna City Corporation. He was re-elected commissioner even after the fall of the autocrat. It was in 1991 that he joined the BNP, an act that let him continue with his crimes. In Bangladesh, it has become an abiding norm of so called democratic governments to flourish on sullied ground. The toppling of a dictator did not change much. A case like Shikeder is a proof that misrule continues under a changed cloak. Until the day of his arrest, he held his post as commissioner; such is the extent of corruption that mars our political culture. In 1997, Shikder joined the AL, allegedly by bribing some of the big guns of the party that came to power in 1996. At that point the unusual happened. His crimes began to translate into newspaper stories with catchy headlines. And it was at this juncture that an 'expel order' was issued from Sheikh Hasina, the then Prime Minister and the president of AL. It is this expel order that dislocated the gangster who was so far had no trouble in keeping many a political leader wrapped around his finger. Police filed a case against him only after he was abandoned by the party in power. It was after a clash with the AL backed group in Khulna jetty No. 4 that Shikder went into hiding. As a criminal, whose past is tied to about 50 killings, he was hanged for one of the most sensational murder, the killing of Jubo League leader Khalid on May 16, 1999. Ershad found himself trapped as all negotiations with the ruling party leaders of his locality failed. 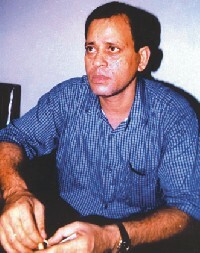 Relatives of Ershad said to the reporters that some Khulna-based AL leaders advised him to surrender and promised an early release. He surrendered to the Sonadanga police on August 11, 1999. Soon his trial began and the local court convicted him of seven murder cases. His path to the gallows was paved from the day the highest court of the country upheld the verdict of the lower court and the death sentence became a certainty when President Iajuddin Ahmed turned down his 'mercy petition'. But what happens to the beneficiaries? Will they be brought to justice as adversaries to crimes? These questions will always remain unanswered, as the politics of our country is structured to protect the people who form the upper crust of society. If Ershad Shikder's sister, Selina's claim is correct, this hardened criminal, in his last bid to dodge justice spent a fortune on some of our fellow countrymen. Selina said to a reporter that after his arrest he spent crores of taka bribing six politicians, a dozen journalists, a number of police officers, and to top it all, 35 businessmen. According to her claim, two of the politicians belong to the BNP and four to AL and two of them have been killed. Selina stressed that she had even lobbied with the political godfathers for her brother's release, but they drove her out. "A leader in Bagerhat was given seven lakh taka and a car, and a leader in Dhaka was given eight crore taka," Selina claimed to journalists. Will this ever be investigated? The answer is NO in capitals, had this been otherwise it certainly would have unmasked the somewhat camouflaged networks of politicians and their brethren. There is no hope for this kind of debunking phenomenon, at least for now people seem more interested in what Shikder was like and what he did to whom. It is not mere speculation to say that any effort to shed light on the people who provided the dreadful man with handles to thrive on would shake the very foundation of current politics. It would become obvious that most politicians, to varied degrees, are coloured with the same hue, though they profess to hold different beliefs. With beliefs they are vocal and loud, but with underhanded matters they are discreet. Shikder was the opposite. He was a cold-blooded murderer himself. He must have been the double 'Y'-chromosome man, who needed to handle things personally. Most politicians rule by proxy of such men who take to violence as ducks to water. It is the nabbing of the people who acted like doting guardians of Shikder that might bring about the real change in the criminalised political scenario.